If you do yoga or hippie dance, then these harem pants will be perfect they fit loosely so will be super comfortable and you'll have bags of room to move around. 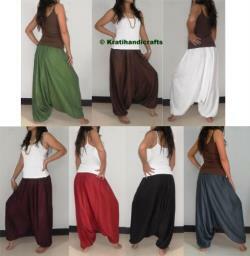 Some of my customers have even worn these for belly dancing. The neutral colors makes this easy to wear with any top and the downward stripe design will make you look slimmer and taller. This is a very flattering pair of women's sweatpants. Small to xl - this is a free size and fits almost all. Waist: up to 40 inches (100cms) when fully stretched. Cotton with hand block print. Qty 20pc in assorted colors (5 color so 2pc in each color). If you want specific colors please leave a note for specific colors.